Washington State is in the top 5 states for the most live gambling venues. They have over 130 to choose from throughout the state. Residents can also play in local poker clubs and home games, so long as they follow the rules. That said, Washington isn't a good place for online poker players. They have some of the most severest punishments if caught, and they are far from regulating online poker, if that's in their future at all. Curious to know what you can and can't do in Washington? You'll have to read on. Is Online Poker Legal in Washington State? Online poker and gambling in general is illegal. The punishment if caught is a Class C felony, a $10,000 fine and/or up to 5 years in prison. Whoever knowingly transmits or receives gambling information by telephone, telegraph, radio, semaphore, the internet, a telecommunications transmission system, or similar means, or knowingly installs or maintains equipment for the transmission or receipt of gambling information shall be guilty of a class C felony subject to the penalty set forth in RCW 9A.20.021. However, this section shall not apply to such information transmitted or received or equipment installed or maintained relating to activities authorized by this chapter or to any act or acts in furtherance thereof when conducted in compliance with the provisions of this chapter and in accordance with the rules adopted under this chapter. Home poker games are legal under state law so long as no one takes a rake, fee or house profit. as used in this chapter, means a natural person who engages, on equal terms with the other participants, and solely as a contestant or bettor, in any form of gambling in which no person may receive or become entitled to receive any profit therefrom other than personal gambling winnings, and without otherwise rendering any material assistance to the establishment, conduct or operation of a particular gambling activity. Do Casinos in Washington Offer Poker? There are many casinos in Washington that offer poker games -- at least 2 dozen. All are operated by local Indian tribes. You'll also find slots, video poker machines and table games like blackjack and 3-card poker. In addition you'll find several poker clubs that run poker tournaments and sngs. 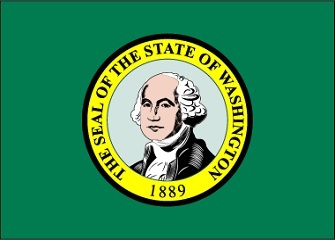 We receive a lot of questions regarding state poker laws and the gambling laws for Washington. We thought that it would be helpful to post our answers below. When will online poker be legal in Washington? There hasn't been any word as of recently. Given their stance on internet gambling, it's hard to see the state changing their tune in the near future. However, you can't discount the fact that other states, such as Nevada, Delaware and New Jersey, will provide insight to states originally against the idea. It's possible that if intrastate poker is successful for these pioneers, that states like Washington will change their tune with time. Here is a timeline of events regarding online poker, gambling and real money regulation in Washington State. We'll update this section as news is released. The first initiative will legalize and regulate online poker. The 2nd will eliminate any penalties against online poker players. This bill would have reduce the penalty from a felony to a civil infraction. Is there an online poker room that accepts players from Washington? There are very few. Washington State is one of those states that US poker sites prohibit from signing up, even for play/fake money. That said, residents are still able to sign-up to BetOnline and Sportsbook Poker. What other forms of regulated gambling is legal in Washington? Washington offers horse racing, a state lottery and charitable gaming, in addition to the casino and poker games made available in their 130+ casinos. Where can I read more about Washington poker laws? Here are some interesting facts about poker and gambling in Washington State. The largest casino / resort in the state is the Muckleshoot Indian Casino. In their poker room you'll find a variety of poker games including Texas holdem, omaha (hi/lo), HORSE and stud, in a variety of cash games and tournaments. Stakes for cash games range from 2/4 to 200/400 and tournaments can be entered for $30.That is pretty crazy for a state that is against online gambling as much as Washington. Washington law allowed $500 all-in bets in addition to the $40 maximum bet. The law was later changed to remove this law. A bill stalled in 2008 that would accept online poker players playing from their homes. Tyler Patterson, a poker pro, is from Everett, Washington. He has won over $1 million in tournament cashes. His biggest cash was a 1st place finish at the LA Poker Classic in February of 2013. He took home $19,080.